Yeah, baby, it’s springtime and that means you are ready to get on your bike and drink! This is a brand new route in a neighborhood I never thought to ride, but breweries have a way of popping out of the woodwork and catching me by surprise. It turns out that Greenwood has been home to a fantastic bike and brew route this entire time. Three is good clustering, but four is a full-blown bike ride. I won’t mention which of these breweries was last to hit my radar, but let’s just say it was the one masquerading as an ice cream shop for the past several years. There are 4 breweries on this route, from north to south it’s Lantern, Flying Bike, Naked City, and Blue Bird. It clocks in at around a mile and a half making it more of a brisk jogging route than a bike route, so if you don’t already live in this neighborhood you’ll be getting your workout by getting here; they don’t call it Phinney Ridge for nothing (ridges go on the top of hills). This neighborhood is great for biking with its dedicated bike lanes on the main roads and gentle hills that boost you along on the way down and challenge you only slightly at the end to earn you that extra beer float right before you finish at the ice cream shop. By the way, want to know what terms like “The Smell” are? Click here for the glossary. Lantern serves a good variety of funky and “out there” beers, my favorite being the bright red beet beer, the Naughty Gnome. You sit separated from the brewery by naught but a rope, making this the Smelliest of the bunch, which is a great thing if you like the feeling of sitting in a homegrown, local, and in-use brewery. This taproom is a classic warehouse style place and holds on to a strong industrial vibe. My favorite type. This is a great place to start the route and fit in a couple weird ones while your taste buds are still fresh. 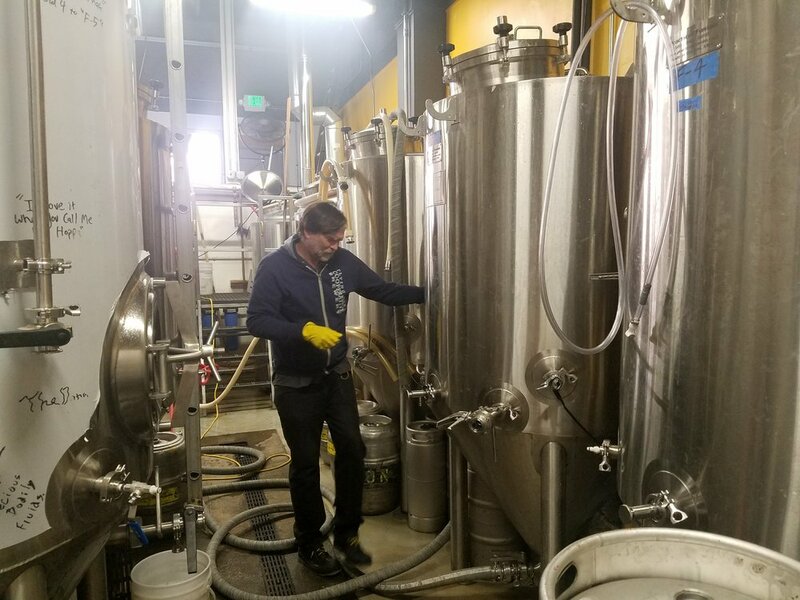 This brewery also appeared on an episode of the Washington Beer Talk Podcast by yours truly, so check it out here or wherever you get your podcasts. Kevin working away at Flying Bike! Now you have a choice to make. Naked City, like Flying Bike before it, serves food, so this is your midway stop for a snack. While Flying Bike is a little more casual, Naked City is a full-blown brewpub with serving staff and everything, so this is the place to go for a sit-down meal. Their beer list isn’t half bad either with a solid stable of staple beers, plenty of rotators, tons of guest taps and a full bar, though I know you aren’t here for that. They are directly next to Flying Bike and love to host joint events with their neighbor in the outdoor lot that connects them. I hear they brewed the most collaborative beer of all time once by piping beer directly from Flying Bike’s kettle into Naked City’s fermentors joining their extra long hoses with a golden hose clamp. As a brewpub, this spot is the least “smelly” on the route, and that's only a bad thing if you want to feel like you are in a brewery, though if you sneak to the back, you can find it. This place may look like an ice cream shop on the outside but it looks like an ice cream shop on the inside, too! Imagine the most adorable boutique ice cream shop you can. Now double that, put it in a waffle cone and pour a nice stout on it; now you are imagining the right thing. 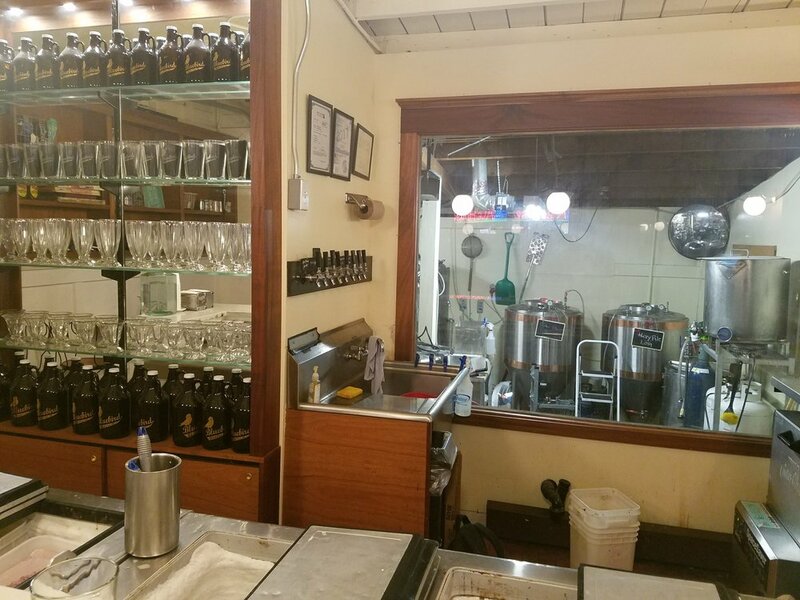 This ice cream shop is home to a barely-larger-than-homebrew sized brewing operation in the back. While you can’t make a ton of beer on their system, you can make enough to mix together one heck of a beer float. Their ice cream follows the standard boutique array of flavors (apparently I am the only one who still likes cookies and cream) and their beers lean towards styles that pair well with ice cream, that is, dark ones. Greenwood is a little neighborhood with a charm that goes a long way, much longer than the ride it takes to get from their furthest breweries. These breweries are surprisingly densely located and provide tons of options for all styles of beer drinkers from the eccentric beers of Lantern to the brewpub fair of Naked City. Check it out sometime and tell them the Cycling Cicerone sent you!